Remembrance Day is the day for all Canadians to recognize the contribution our veterans have made and to honour those who made the ultimate sacrifice on behalf of Canada. Remembrance Day is always on November 11. 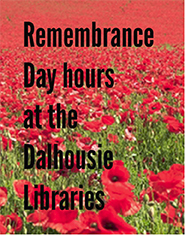 The Dal Libraries will be observing holiday hours on Wednesday, November 11. 1:30 p.m. – 8:30 p.m.